In an economy powered by knowledge, better use of knowledge can lead to shorter time to market and less risky and more vibrant new products. To take advantage of the wisdom within the organization, how do you transfer best practices and lessons learned from project to project, from team to team, and from person to person within product development? 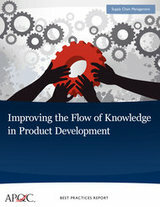 Ecopetrol was among five best-practice organizations studied in APQC’s Collaborative Benchmarking study Improving the Flow of Knowledge in Product Development. This case study provides a comprehensive overview of how Ecopetrol incorporates, transfers, and sustains new knowledge and industry best practices in its areas of operation.